Pioneers in the industry, we offer chloramphenicol ear drops (5ml), tropicamide eye drop, ciprofloxacin eye and ear drop 5ml, sodium cromoglicate eye drops bp, moxifloxacin eye drops and sulphacetamide eye drop from India. 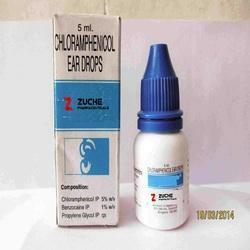 Description: Chloramphenicol Ear Drops are used to treat bacterial infections of the ear. Chloramphenicol belongs to a group of medicines called antibiotics. Indications and Usage: Chloramphenicol ear drops are indicated for the short term treatment of infections in otitis externa due to chloramphenicol-sensitive organisms in patients with intact tympanic membranes. Pack Size: Chloramphenicol Ear Drops is available in 5ml plastic dropper bottle or as per buyer's specification. Tropicamide eye drops contain the active ingredient, which is a type of medicine called an anticholinergic (or antimuscarinic). It is used to aid eye examinations. Description: Ciprofloxacin ear drops are a quinolone antibiotic. It works by killing sensitive bacteria. Ciprofloxacin has in vitro activity against a wide range of Gram-negative and Gram-positive organisms. The bactericidal action of ciprofloxacin results from interference with the enzyme DNA gyrase which is needed for the synthesis of bacterial DNA. Thus, vital information from the bacterial chromosomes cannot be transcribed, which causes a breakdown of bacterial metabolism. For all Ear infections, 2-3 drops every 2-3 hours initially, reducing the frequency of the instillation with control of infection. 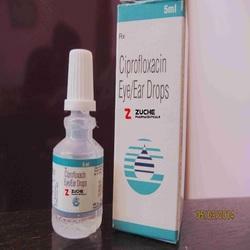 Pack Size: ciprofloxacin eye and ear drops is available in 5ml plastic dropper bottle or as per buyer's specification. Common Name: Anti-allergic preparation for eye. Strength : 2.0% w/v sodium cromoglicate . Sodium cromoglycate eye drops belongs to the medications called mast cell stabilizers. It is used to help relieve and prevent seasonal allergy eye symptoms such as itching,tearing, and redness. Relief of symptoms usually occurs within 2 to 3 days of starting the medication. 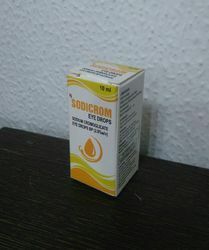 sodicrom eye drop contains sodium cromoglicate which works by acting on certain cells to prevent the releasing substance that cause the allergic reaction . Sodium cromoglicate eye drops is used to treat allergic eye conditions such as hay fever and conjunctivitis,which are conditions that can itching ,redness ,discomfort and watery discharge from the eyes. 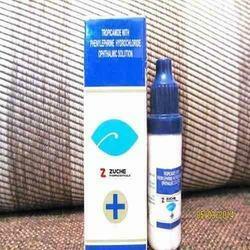 Pack size: Sodium cromoglicate eye drops available in 10ml pack size. Moxifloxacin ophthalmic solution (Eye Drop) is used to treat bacterial conjunctivitis (pink eye; infection of the membrane that covers the outside of the eyeballs and the inside of the eyelids). Moxifloxacin is in a class of antibiotics called fluoroquinolones. It works by killing the bacteria that cause infection. Sulfacetamide Eye drops is a sulfonamide. It works by restricting the production of folic acid, which bacteria need for growth. This kills the bacteria. 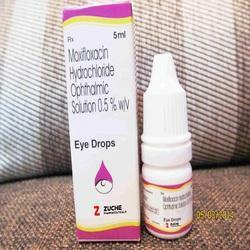 Suphacetamide Eye drop is used to treat bacterial eye infections (such as conjunctivitis). It belongs to a class of drugs known as sulfa antibiotics. Sulfacetamide works by stopping the growth of bacteria. Comman name: Olopat eye drops. DESCRIPTION: Timolol belongs to a class of drugs known as beta-blockers. This medication is used to treat high pressure inside the eye due to glaucoma or other eye diseases (e.g., ocular hypertension). This medication works by decreasing the amount of fluid within the eye and by lowering high pressure inside the eye to prevent blindness. 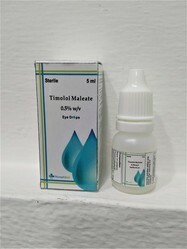 PACK SIZE: Timolol Maleate Eye Drops are available in 5ml dropper bottle. Dexamethasone eye drops are used to treat short-term inflammatory eye conditions and are usually prescribed by an eye specialist. The drops contain a corticosteroidS (sometimes called a 'steroid') which helps relieve inflammation, redness and irritation. Dexamethasone drops is a corticosteroid. It works by decreasing or preventing tissues from responding to inflammation. It also modifies the body's response to certain immune stimulation.